DONETSK, Ukraine -- The fate of eastern Ukraine is being decided at gunpoint in this city, as pro-Russian separatists seize control with political cover from Moscow. 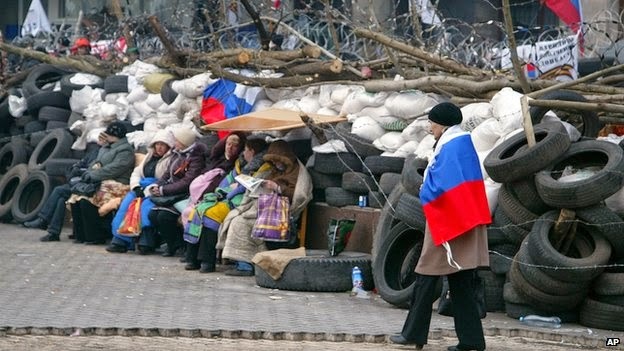 These activists man the barricade outside a government building in Donetsk. But many of the locals are sticking their heads in the sand, having never grappled with the questions of identity this crisis raises. Apart from a small barricade of tires blocking the backdoor, there was no outward sign that the city hall in Ukraine’s fifth largest city, Donetsk, had been taken over by armed separatists on Wednesday morning. They hadn’t even replaced the building’s Ukrainian flag with the Russian one yet. If a local resident like Anastasia Marova, a student at the city’s technical college, had wanted to see them, she would have had to walk through the sliding glass doors of the main entrance, where a handful of nervous men with shotguns and assault rifles were guarding the turnstiles. Instead, Marova walked past the entrance that afternoon toward the picturesque sculpture garden at the rear of the building, and sat down on a bench to munch sunflower seeds and talk to her friend Alina. All around them couples were strolling and children playing on the playground next to city hall, within easy range of the gunmen peering through its windows. There were no policemen in sight, and even the people who had heard about the siege that day, either on the news or through the grapevine, didn’t seem to care very much about it. “Whatever,” Marova told this reporter when informed that she was, technically, in the line of fire. “They’re not there to shoot me,” she said, and popped another sunflower seed into her mouth. For a city whose government buildings have been taken over by masked gunmen, whose police force has essentially stopped functioning, and whose streets could soon be overrun by the Russian tanks poised to invade from across the nearby border, Donetsk is incredibly calm. The terraces of its cafes are full of leisure-seekers smoking water pipes and drinking beer. Its parks are full of people going for bike rides and taking walks. Even city hall is functioning, despite the armed men camped out in its corridors. Almost everywhere, city residents are near indifferent to the fact that this city’s future is being decided at gunpoint right now, with or without their input. Ever since Russia began threatening to take all of eastern Ukraine under its military “protection” several weeks ago, the city’s passivity has come through starkly in various opinion polls. The most recent one, conducted on March 25-28 by the Donetsk-based Institute of Social Research and Political Analysis, found that 46% of respondents believe the locals should take a “neutral, patient position” in case of a Russian invasion. Only one fifth said they would support a Ukrainian effort to resist the Russian forces, according to an advanced copy of the poll results obtained by TIME on Friday. Another fifth said they would welcome the Russian tanks. But perhaps most surprising was the data on how many locals were even paying attention. Nearly a quarter of them did not express “stable or high” interest in what was going on in their city. “That is part of what makes Donetsk special,” says Alyona Hetmanchuk, the director of a think tank called the Institute of World Policy, which is based in Kiev, the capital. The city of Donetsk, whose emblem is a clenched fist holding a hammer, has always been known as a bulwark of the proletariat, particularly coal miners and factory workers whose income these days comes out to a few hundred dollars a month if they’re lucky. “This is a society where both pragmatism and paternalism are very strong,” says Hetmanchuk. “They are very disciplined, very hard working, which is the positive side of their Soviet mentality. Up until this winter, that leader was Viktor Yanukovych, the President of Ukraine and a native of Donetsk whose political party held an effective monopoly on power across the region. For years he lavished Donetsk with pork barrel spending and placed its native sons in senior posts across the country. But when the revolution chased Yanukovych from power in February, he and his allies were completely discredited, particularly after his decision to flee to Russia rather than return to his hometown. The vacuum of authority he left behind became fertile ground for the region’s pro-Russian separatists. But the locals don’t seem to be playing along. Instead of coming out en masse to support an alliance with Russia, they have mainly chosen to tune out, turn inward, and hope that the situation somehow resolves itself without affecting them too much. On April 16, Hetmanchuk, whose think tank broadly supports the new government in Kiev, visited Donetsk to hold a focus group with what she calls “opinion makers” in the city – prominent businessmen, university officials, activists and community leaders. She spent much of the time trying to get a rise out of them. “This was the intellectual elite, and they kept asking why Kiev doesn’t come to save and protect them,” she says. Never in its history has Donetsk really faced those kinds of questions. Since the break up of the Soviet Union, its role as a blue collar buffer between Russia and Ukraine has left it dangling between two worlds, neither invested in the Ukrainian mission to define itself as an independent nation, nor wholly subsumed into Russia’s cultural matrix. According to the survey conducted in late March, the identity of Donetsk residents is deeply fragmented. Only 36% consider themselves citizens of Ukraine. About a fifth say they are “Russian-speaking residents of Ukraine,” while 29% call themselves part of a unique entity – “people of the Donbass,” the gritty mining region that surrounds them. “Honestly, before these last few months, we never much bothered to consider who we were,” says Tatyana Deduk, a middle-aged lawyer and native of Donetsk. What finally forced the question of identity for some of them was the uprising that broke out in late November. Its aim was to make a lasting break from Russia and set Ukraine on a path toward Europe, and it kept Deduk glued to the news for months, watching the protesters battling police in the streets of Kiev, seizing government buildings, singing the national anthem every hour on the Maidan square, and waving the flag of Ukraine and the European Union. Only in March did she get her chance to protest. The victory of the revolution, which brought a new pro-Western government to power, had infuriated many of the region’s Russians, and some of them started calling for Donetsk to break away from Ukraine. To counter that movement, a small group of activists started holding rallies for the unity of Ukraine and its ambition to ally with Europe. It proved a dangerous campaign. Several of their rallies clashed with pro-Russian counter protests, or were attacked by separatist thugs wielding bats and clubs. “The neurological trauma ward was filled with our guys who’d been knocked on the head,” says Dmitro Tkachenko, the activist who helped organize all of the rallies for Ukrainian unity in Donetsk. One activist from the nationalist Svoboda party, Dmitro Chernyavskiy, was killed on the square on March 13, leading the organizers to put a moratorium on any further demonstrations. Only on April 17 was that moratorium lifted. Tkachenko and his fellow activists staged a rally that evening to oppose the armed separatists who have taken over city hall and the headquarters of the regional government. Police warned residents to stay away, fearing another attack by the separatists. Several thousand people showed up anyway, a sizable showing by local standards but thin considering the gravity of the issues they are facing. At the microphone, Tkachenko started things off with a rendition of the national anthem of Ukraine, and many of the Russian-speakers in the crowd didn’t seem to know the lyrics, which are in Ukrainian. After the first chorus, about half the crowd began cheering as if the song was over, drowning out demonstrators who continued to sing the rest. One of the star speakers that evening was Nikolai Volynko, the ruddy, potbellied chairman of the local miners’ union. “A lot of people told me not to get mixed up in all this,” he told the crowd from the rickety stage set up on a square near the edge of town. But not too many of his fellow miners had followed Volynko to the demonstration. Asked about this afterward, he said he was was sure that eventually his men would “rise up” and take a position on whether they are, in fact, Ukrainians or not. “It’s like a snowball,” he says. Deduk, the local lawyer, wasn’t so sure. Sitting on a bench with her son Stepan at the edge of the demonstration, she said most of the people she knows are content to stay on the sidelines, and if Russia comes in and conquers the region like it did with Crimea last month, they’ll most likely shrug and accept it as their fate. “People forget all the horrors we faced under Moscow during the Soviet Union,” she says. As the sun set, Tkachenko announced from the stage that the demonstration was over, and the people went on their way, some lingering on park benches to talk politics. Across town at city hall, the separatists had already taken down the Ukrainian flag and reinforced their barricades around the building. But the sculpture garden next to it was as tranquil as ever, full of people seeming to live, or pretending to live, in a world immune to politics.